The Europa Report is about a manned space mission to Europa, for those of you who don’t know, Europa is a moon of Jupiter. These astronauts go there in hopes of finding life, in the form of bacteria and stuff, and not the little green men type. The good; I love sci fi, and I love this hard sci fi stuff. Europa Report reminds me of these other movies; Moon, Silent Running, Sunshine and 2001. And to a certain extent Mission to Mars, everything before they actually get to Mars. There’s something about man facing the elements, or lack of, in space. Europa Report follows in that tradition. The science fiction of this movie makes me believe that a mission to Europa could actually happen. Adding to the science of it is the way the movie was filmed. We’re watching an uploaded report, inter-cut with talking heads from the team on Earth and other things. There isn’t much that feels staged, it’s as if we’re just watching the surveillance footage from their mission, just edited together. It’s using the tricks found in Paranormal Activity but in a sci fi world, and for that I love it. The story is told in a non-linear fashion… I don’t think that added anything to the experience. It makes me wonder how the film would be if it were edited chronologically? I’d like to think that the impact of certain scenes would still hold up, if not more so. Oh well. *SPOILERS* When the first victim (Sharlto Copley) bites it, the moment is simple and not an action scene with huge explosions. Very similar to Tim Robbins’ death in Mission To Mars. Really liked how they covered that scene. Overall I had fun going on this journey, but was left very in the middle when the credits came up. The music is done by the great Bear McCreary. 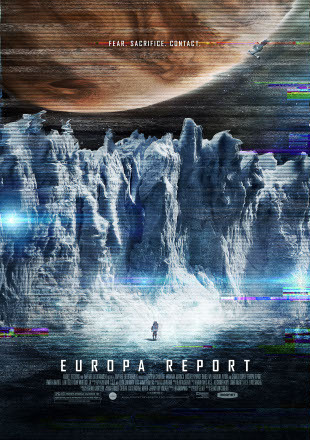 If you like hard science fiction, I would recommend Europa Report, but look past it’s flaws. But it feels like there was a missed opportunity for a great movie here. This entry was posted in Movies/TV, Reviews and tagged europa report, europa report film, europa report movie, europa report movie review, movie review, sci-fi, sci-fi movie, space on August 8, 2013 by Eugene.